There are so many benefits to walking in lavender fields. There is the heavenly perfume which surrounds you, the lush green landscape of trees and and flowers. During a recent visit to one of the farms I was able to explore the nearby woods which led to another lavender field. It was fantastic. 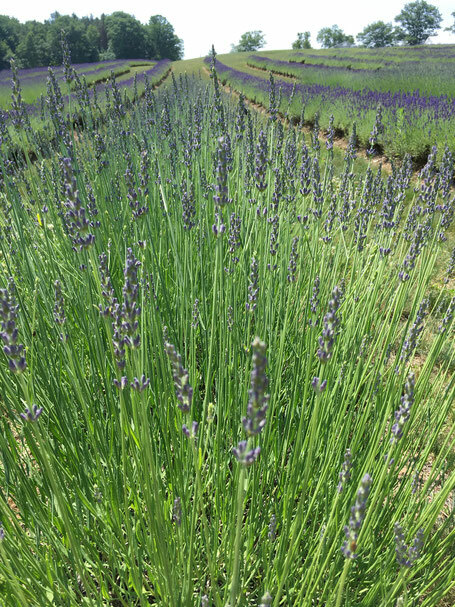 One can easily practice mindfulness while at a lavender farm as it really is a peaceful place. It also offers an opportunity to recharge, take a break and just enjoy some peace and quiet. Using a lavender spray for linens is a great way to enjoy lavender at home. Also misting a room before bed is a great way to unwind. Lavender soaps, lotions and shower gels also brings that relaxing scent to your bath experience. Culinary lavender is another way to experience lavender in salts/herbes de provence -which you may want to use as a marinate for chicken/ or lavender in your favourite shortbread recipe or my favourite- truffles. Practicing reiki outdoors is another way to unwind. Bring your zero gravity chair or lounge chair and practice on a family member/pet/friend..it is a great experience.